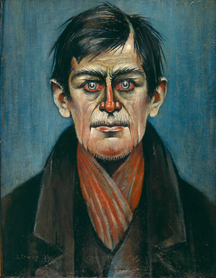 This exhibition focuses on Lowry’s work from the beginning of the 20s to the immediate post-war period, from his early forays into the industrial scene to the point at which he began to achieve a degree of commercial success and his interests shifted into the territory of figure painting. In the 1930s, personal crisis brought about by the death of his parents, and the artist’s growing sense of isolation, produced a kind of artistic derailment resulting in an extraordinary body of work whose subject matter chimes with the national zeitgeist of pre-war angst: his views of empty industrial wastelands, derelict buildings and a disturbing series of staring portrait heads will all come as a revelation to those who only know Lowry as the poet of the Lancashire mills. Hugely impressive and well worth seeing. The landscapes and portraits are particularly striking. It’s on at the Djanogly Gallery, Lakeside Arts Centre at the University of Nottingham until 5 February 2012. This entry was posted in Community, HE, University, University of Nottingham and tagged campus, Djanogly, exhibition, Lakeside, Lowry, University of Nottingham by Paul. Bookmark the permalink. The exhibition is fantastic — I’ve never seen the place so busy either. Looks like it’s a big hit.